Antioxidants hold a position of privilege among health conscious individuals. These powerful substances have the ability to locate and destroy free radicals, which are unstable atoms that can lead to illness and aging. Antioxidants are essential for overall health and wellness, but in particular they can promote clear skin and reduce the effects of acne. Here is a look at four particular ones that do just that. Keep in mind that antioxidants do not treat the underlying causes of acne, and therefore cannot eliminate your problems entirely. However, they are indeed powerful enough to help you along your quest for healthy skin. Vitamin C is one of the most well-known antioxidants around, and it can be found in everything from citrus fruits to chili peppers. This essential nutrient helps regulate a large number of the body's activities, including immune system function and cardiovascular health, but most importantly for acne sufferers, it's a great way to help keep the skin looking youthful and free from breakouts. Vitamin C helps stimulate the production of collagen, which is an essential building block for skin, but it also can help reduce inflammation associated with acne and lessen the effects of breakouts. When choosing a source of vitamin C, it's best to get your daily supply from foods that contain it instead of supplements, which may put you at risk for overdose-when taken in large quantities, vitamin C can lead to some unpleasant side effects, like nausea, vomiting, and diarrhea. Vitamin E is essential for healthy skin cell growth because it combats free radicals that threaten to compromise the process. While this particular nutrient may not do much to treat your current breakout, it does work very well at reducing the size and severity of acne scars from previous ones. One way to get a good dose of vitamin E is through your diet-healthy foods such as almonds, dark leafy greens, avocadoes, and broccoli all contain significant amounts of the substance. In terms of treating acne scars, preventing new acne from forming is the first crucial step to getting rid of acne scars and marks. There is definitely a correlation between zinc and acne-studies show that people who routinely suffer from breakouts have lower levels of this mineral in their blood than those who don't. In addition to these studies, others have shown that acne sufferers who begin taking a zinc supplement have lower pimple counts than sufferers who don't. In terms of skincare, zinc is so effective at combatting blemishes because it kills acne-causing bacteria and reduces the inflammation associated with these bacteria. Foods such as fish, wheat germ, and spinach all contain zinc, but in this case taking an oral supplement might be a better route. Some research has indicated that only particular varieties of zinc contain acne-fighting properties, and it can be difficult to determine whether or not high-zinc foods contain them. Instead, look for an all-natural supplement that contains zinc picolinate or zinc methionine specifically. For many years, scientists did not consider omega 3 fatty acids as antioxidants. However, new research has indicated that these acids do indeed have some free radical-fighting properties. Current studies also indicate that omega 3s are great for dealing with acne-in fact, they can both reduce pimple count and inflammation associated with breakouts. It's possible to get omega 3s from oral supplements, but choosing foods high in this substance (like salmon) may be a better choice, due to the unpleasant aftertaste caused by the supplements. Again, keep in mind that these additions will not treat your acne alone. It is imperative that you chose a treatment first because a treatment is the only thing that will get rid of your acne. These antioxidants will only compliment the treatment. 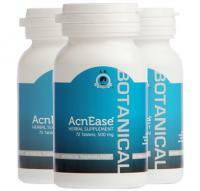 Our AcnEase users have already done so, and have seen a 96% success rate. People come to us after they've tried everything else - so what are YOU waiting for?